Instead of writing the paragraphs I used to write on these, I'm going to try a bullet point outline. - The Kotoshigiku sumo card is kind of an oddball. He was originally card #06 in the sumo set which I think is numbered according to the rankings of the wrestlers. From his wikipedia page, it looks he moved up in the rankings in January so the SCM card is #03 in the sumo set. Does that make sense? - Most of the items in the "newsprint" section are difficult for the non-Japanese reader like myself to figure out but one item did stand out - BBM and Nippon Ham are teaming up to produce a set of cards for the Fighters that will be distributed with Nippon Ham's "Home Run Sausage" products starting April 20th. I think there are 68 possible cards in the set. Details are here. 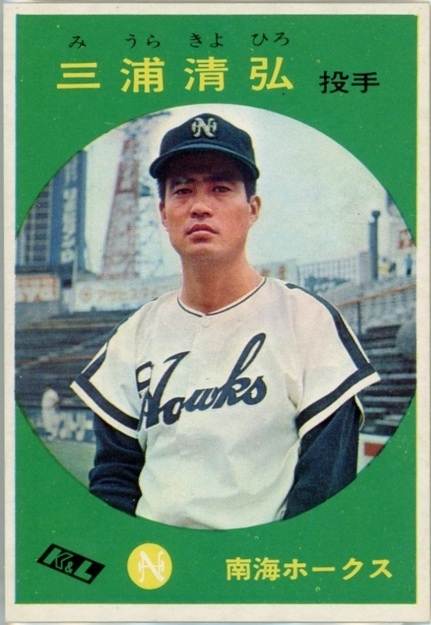 I haven't seen any coverage of this in English but NPB Reddit mentioned the other day that former Nankai Hawks pitcher Kiyohiro Miura has passed away at age 77. 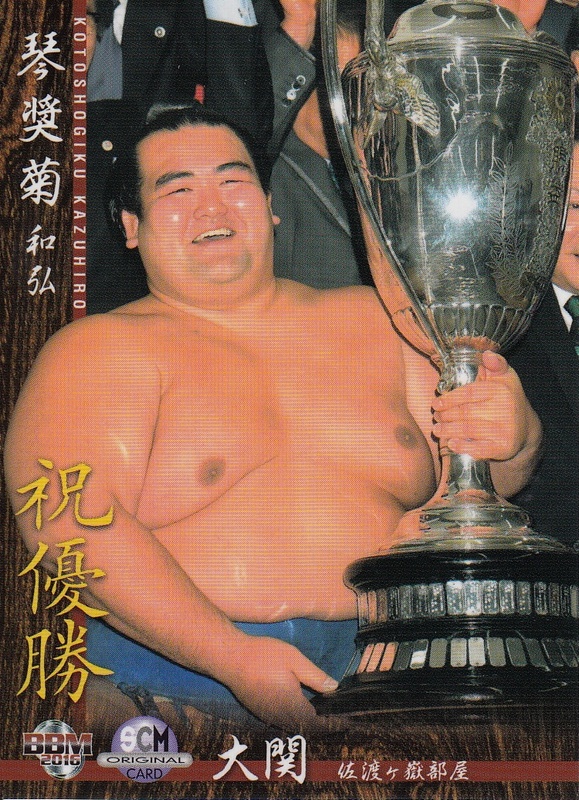 I looked up his Japanese wikipedia page and it confirmed that he had succumbed to pneumonia on Sunday in Osaka. Miura had a 19 year career in NPB, signing with the Hawks prior to the 1957 season out of Beppu Tsurumioka High School. He was sold to the Taiheiyo Club Lions after the 1972 season and he retired at the end of 1975. He coached for the Lions in 1976 and 1977 and later ran a fugu restaurant. 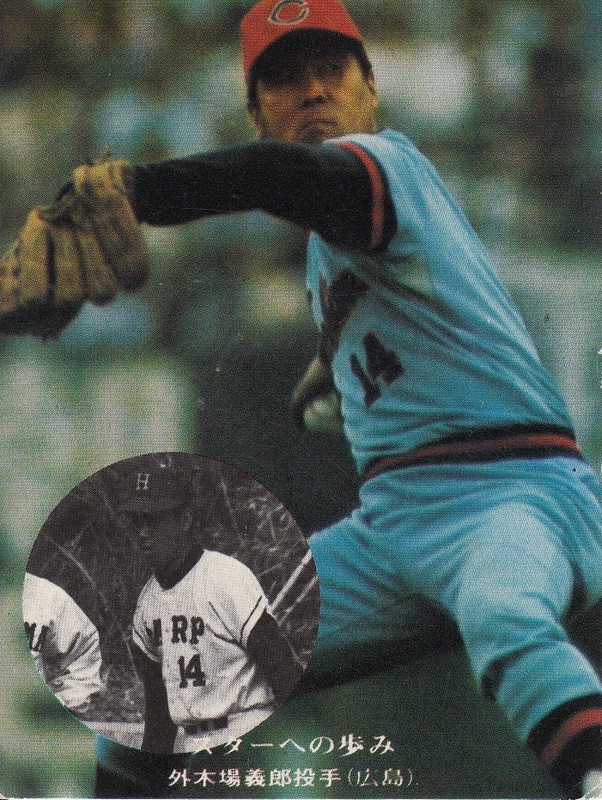 His best season was probably 1965 when he went 11-3 and lead the Pacific League in ERA (1.56). 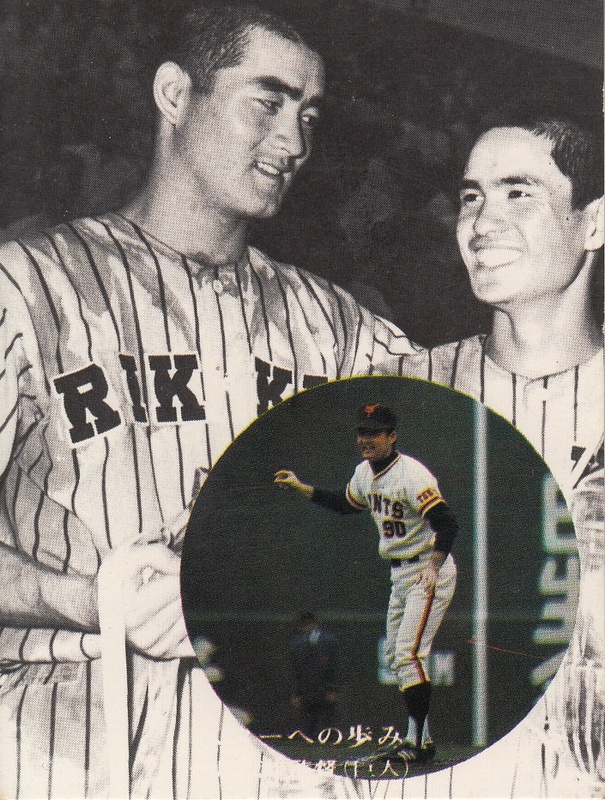 He was selected to two All Star teams (1965 & 1966) and played in four Nippon Series (1959, 1964-66). *The Lions play "Daydream Believer" after every win at Seibu Dome. I'm not sure who the artist on the recording is but it's not the Monkees. You can hear it in this video. I am frequently asked how I watch Japanese baseball games here in the States. I used to use Justin.tv until Google shut it down a few years back. I then switched to win24tv.com, a Korean site, but I've never been very comfortable with it. 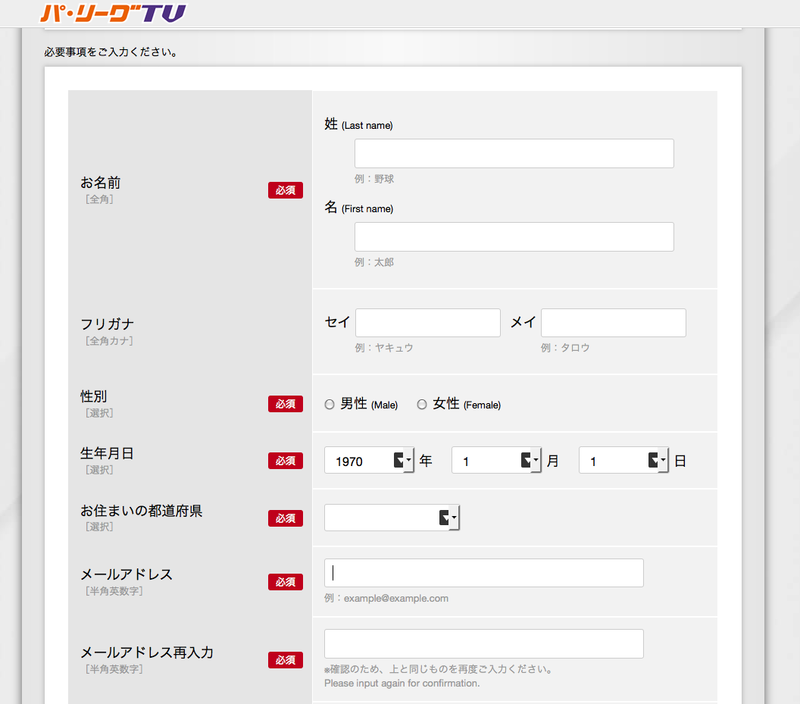 I've always said that I would be willing to pay for something like MLB.TV for NPB but there isn't one. 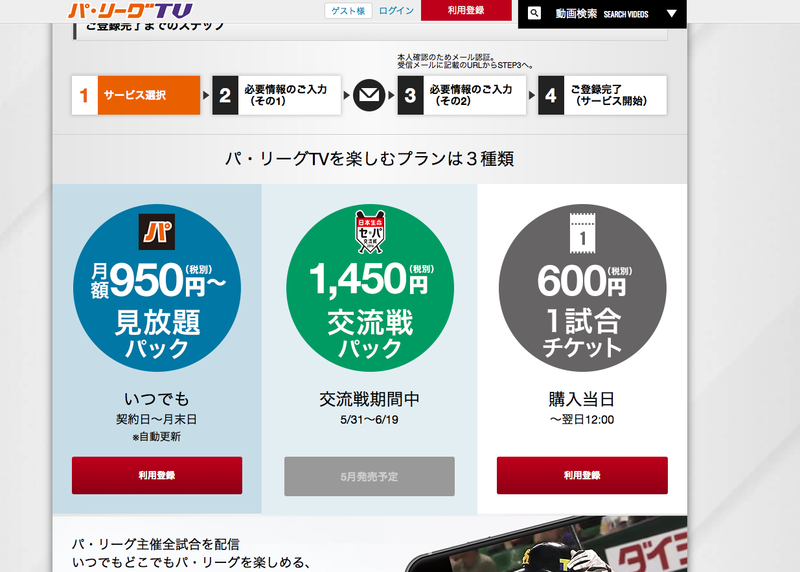 There is Pacific League TV but I was never sure about whether or not I could sign up for it without a Japanese address, bank account or credit card and whether or not I could view it from outside of Japan. And rather stupidly on my part, I never attempted to find out for myself. It turns out that the answer to those questions is "yes, it is possible to sign up for PLTV from outside of Japan with a non-Japanese credit card" and "yes, it is possible to view the games on PLTV from outside of Japan". And it also turned out that it's ridiculously simple to sign up. 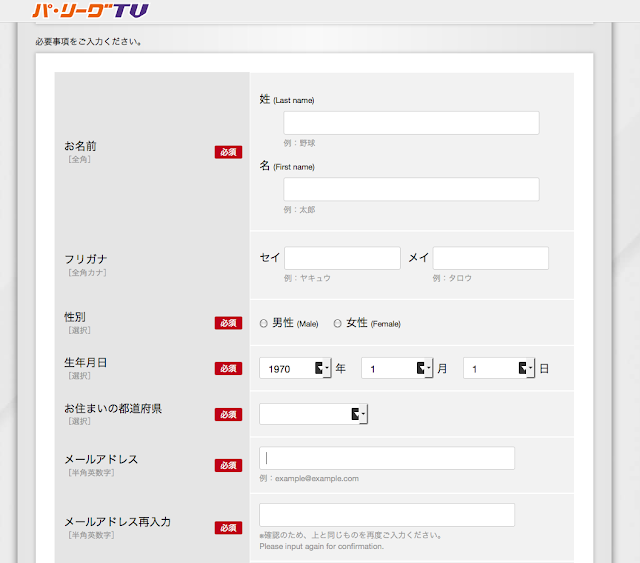 The easiest way to sign up is to use a browser that automatically translates Japanese to English (I use Chrome) and go to the PLTV website. There's a red button at the top of the page with text that says "利用登録" which translates to "On registration" (at least on Chrome anyway). NOTE - all the screen shots I'm going to show don't have the automatic translation - just to show how easy it is even without the translation. Once you click on that, you'll be taken to a page that allows you to select what kind of membership you want. Your options are the "unlimited viewing package" (at either 950 or 1450 yen per month plus tax*), interleague only (flat rate of 1450 plus tax but it's only available from May 31 to June 19) or a single day's games (600 yen). 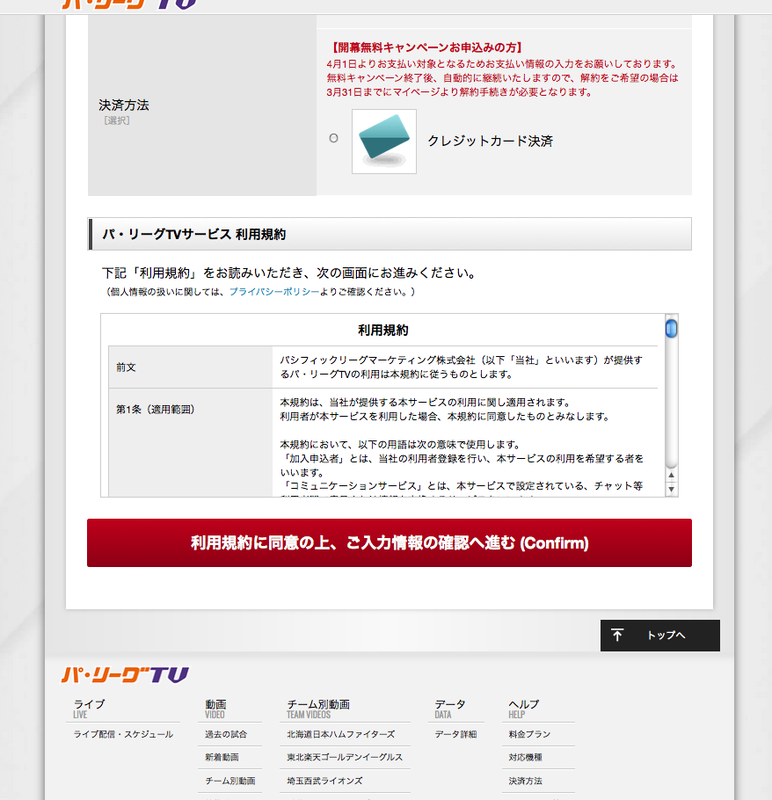 I signed up for the "unlimited viewing package" and was taken to the registration page. I will point out that PLTV is currently doing a promotion where you can watch for free from now until the end of March so this page currently looks different than the screen shot I'm showing here. Some of the elements on the registration page have English on them, even if you don't have them automatically translated. The page is long enough that I had to split it up into three screen shots. I'll go over each of them in order. The red boxes labeled "必須" indicate required fields. The first two fields ("お名前" or "Your name") are your last and first names. The next two fields ("フリガナ" or "Yomi") (which are not required) are apparently used if the kanji version of your name has an alternate reading in hiragana. Since I suspect that most people reading this don't use kanji for their names, just leave these blank. The next field ("性別") is for your gender (obviously) and followed by your birthdate (生年月日) - the fields are for year, month and day. The next field ("お住まいの都道府県") is where you have to lie a little bit - it's for which Japanese prefecture you live in. I didn't see an "outside of Japan" option so I said "Tokyo". The next two fields ("メールアドレス" and "メールアドレス再入力") are for your email address - the second one is to confirm that you typed it into the first one correctly. The next two fields ("パスワード" and "パスワード再入力") are for your password - again the second field is to confirm what you typed in the first one. 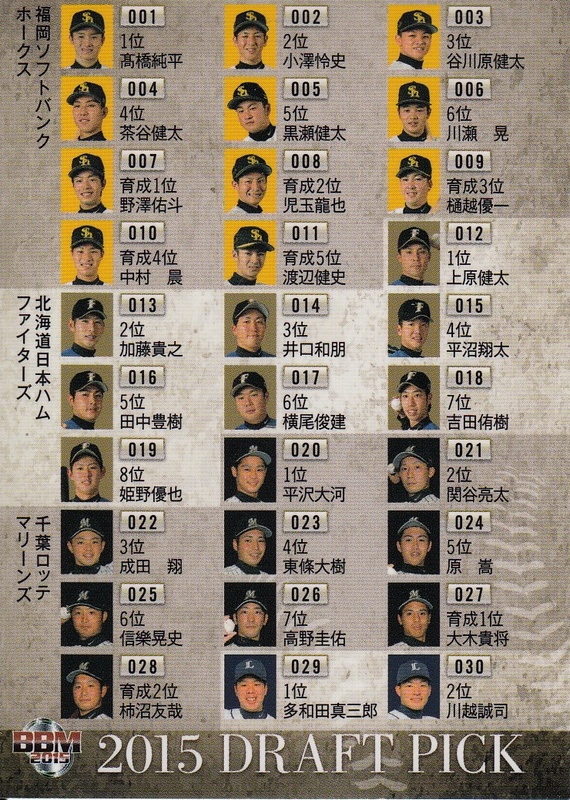 The next field ("お好きな球団") asks for your favorite team - all 12 NPB teams are listed, not just the Pacific League ones. The next two fields (which are not required) are how you would specify if you belonged to PL team's fan club. The first field ("球団有料ファンクラブ") is where you select whether or not you're a member. If you select "Member", the second field ("対象球団/会員番号") will ask for which team and what your membership number is. 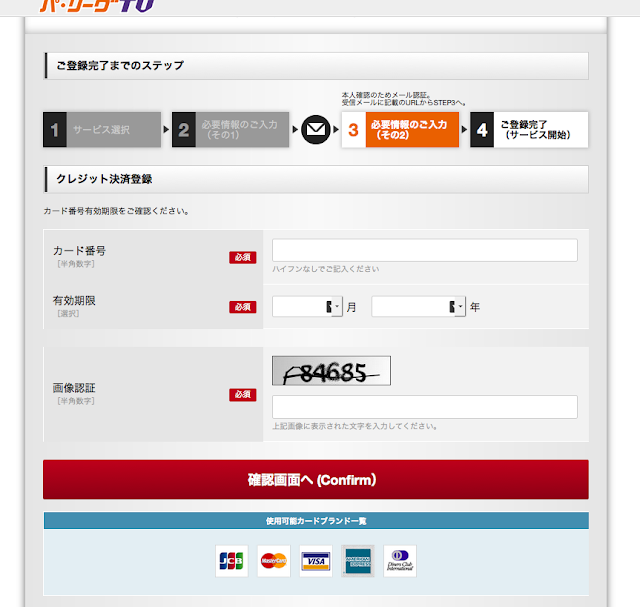 The last field ("決済方法") is where you select your payment type - currently you can only pick credit card ("クレジットカード決済") but when I signed up a few weeks ago you could also pick some sort of e-payment plan offered by Yahoo! or Rakuten. 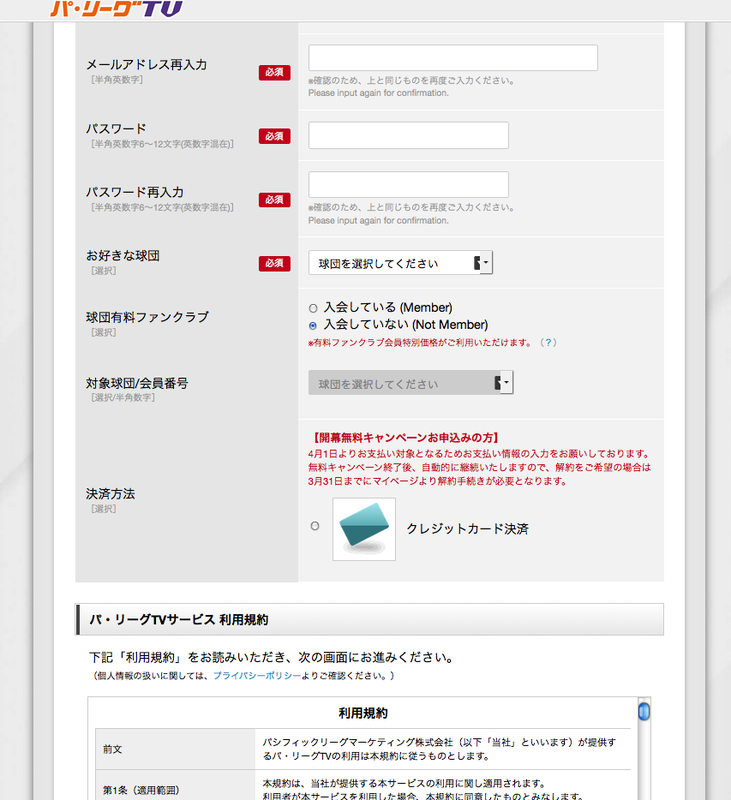 Once you're filled in all the required fields, click on the red button towards the bottom of the page labeled "利用規約に同意の上、ご入力情報の確認へ進む (Confirm)". At this point, PLTV will send a confirmation email to the email address you entered above (assuming that they validated everything you entered in the form). That email will contain a link that you'll follow to confirm that you gave them a valid email. At this point you'll be asked to enter your credit card information. The first field is for the number on your credit card. The next two fields are for the expiration date - month first, then year. The last field is a captcha code to confirm you aren't a robot. Once done, hit the big red button and PLTV will charge your credit card. With the 116 yen tax, the total was 1566 yen which worked out to around $14. I hope this makes sense and is helpful. It was very simple to do and I'm regretting not having done it previously. NPB Card Guy was nice enough to let me share my collection with his readers, so here goes. 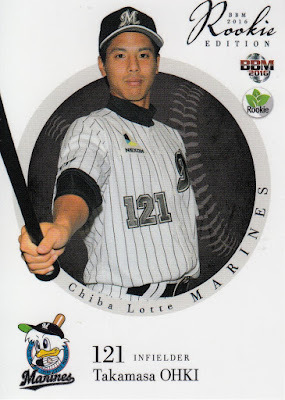 I collect NPB Rookie Cards of guys who have made the jump to MLB. Whenever possible, I try to acquire Gem Mint graded copies of each player on my wish list. I’ve been an avid baseball card collector since I was a kid in the late-80s and my interest in Japanese baseball initiated along with thousands of other Americans – I got caught up in Nomomania. 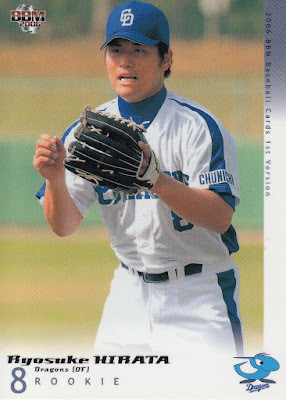 When Hideo Nomo burst onto the scene in 1995, it blew my mind in so many different ways. His electric stuff, the windup, the foreign language, I was hooked. How could someone from a far away land just appear in MLB and dominate hitters? I needed to know more about this professional league across the world and if there were other talented players like Nomo in Japan. Gradually, NPB players made the move to MLB over the years and I followed their careers. 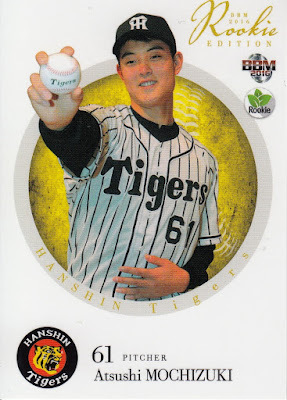 When I found out these players had NPB cards, that was it, I just had to get my hands on those cards. 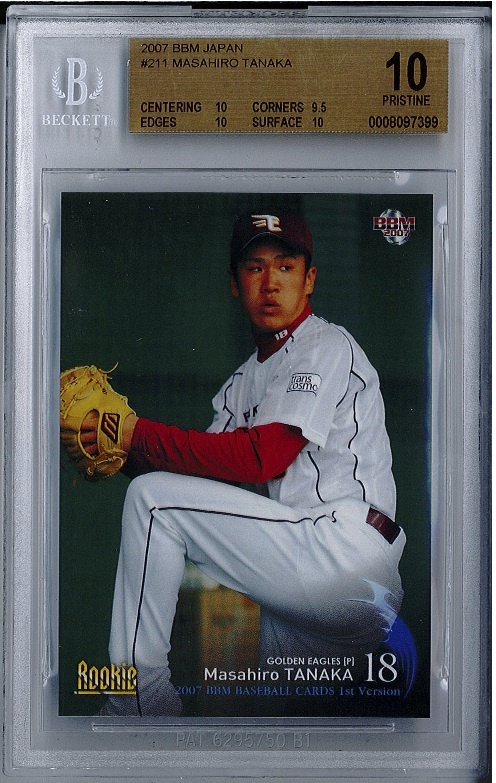 Ebay was essential, but I’ve also acquired cards through private sales from other NPB card collectors. 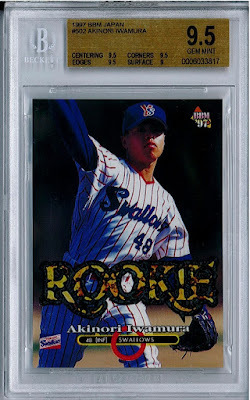 I’ve always collected MLB Rookie Cards, specifically MVP and CY Young Award winners. As I got older and could afford higher priced cards, I began to purchase graded Gem Mint copies for my collection. 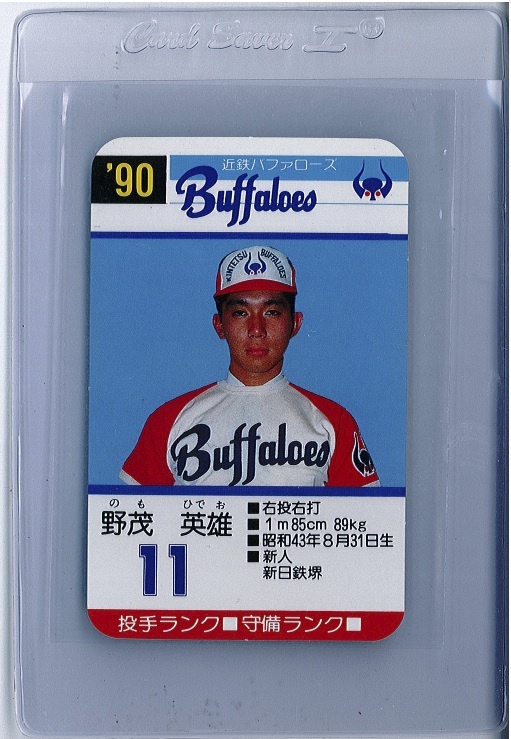 I decided to replicate this for my new NPB collection. A few notes on this list. Junichi Tazawa and Dave Roberts were born in Japan, but never played in NPB, so they are not included. 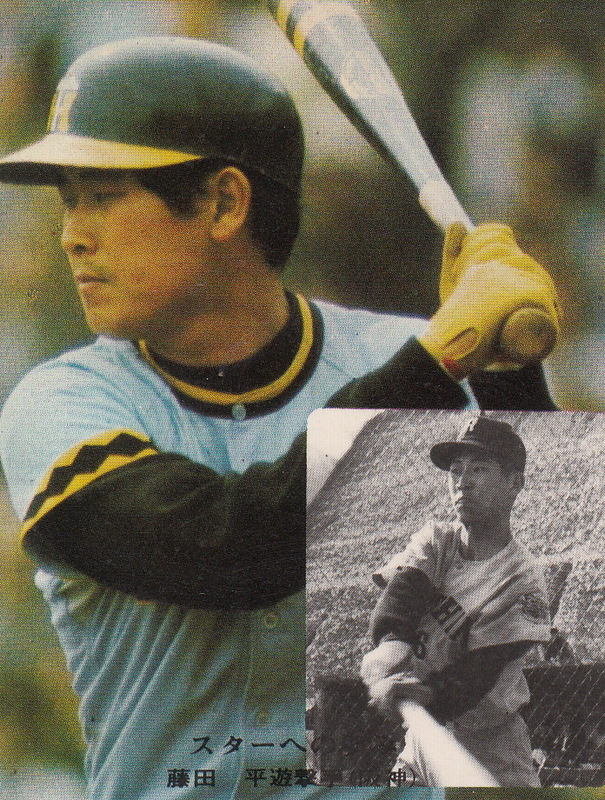 Mac Suzuki only played in NPB after his MLB career, he’s not really an NPB import, so I didn’t include him either. 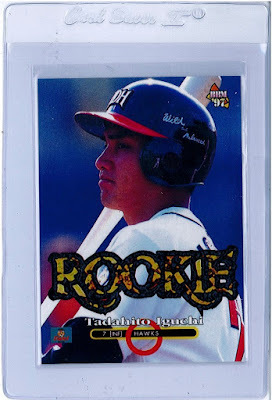 There are many, many different interpretations collectors have for what constitutes a Rookie Card. 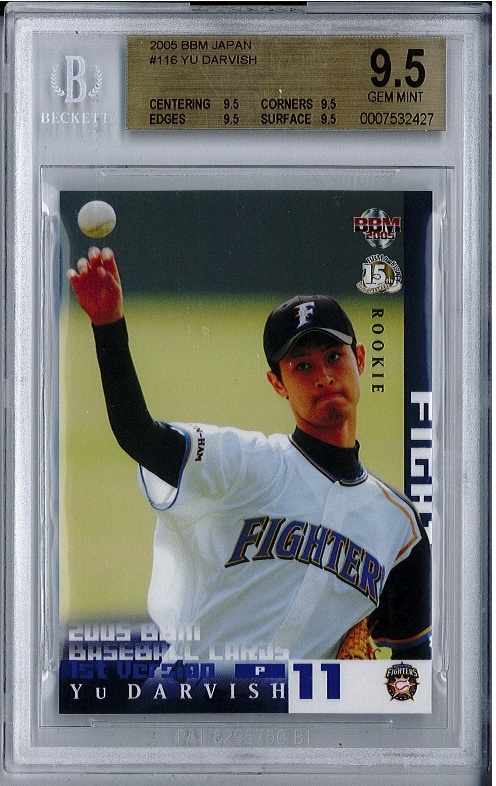 My definition is simply the first time a player appears on a licensed card [EDITOR'S NOTE: David clarified that he's looking for the first "flagship" set appearance as the first cards of Aoki, Darvish and Tanaka are from BBM's Rookie Edition sets). For my NPB Rookie Card collection, I always look for BBM cards unless a player’s first card was not from BBM. 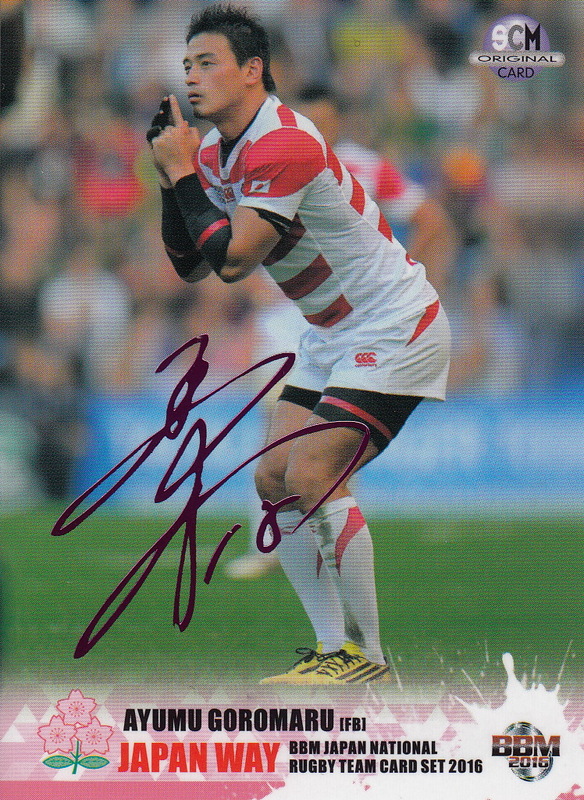 The guys in bold I have acquired – you can check out those cards in the images accompanying this post. If you have one of the rookies that I don’t have in Mint condition, let me know if you are interested in selling it to me in the comments section and maybe we can work out a deal. The hardest part about acquiring cards for my collection has been the scarcity of Gem Mint graded examples. NPB card collecting is a niche hobby to begin with and few people submit their cards for grading. 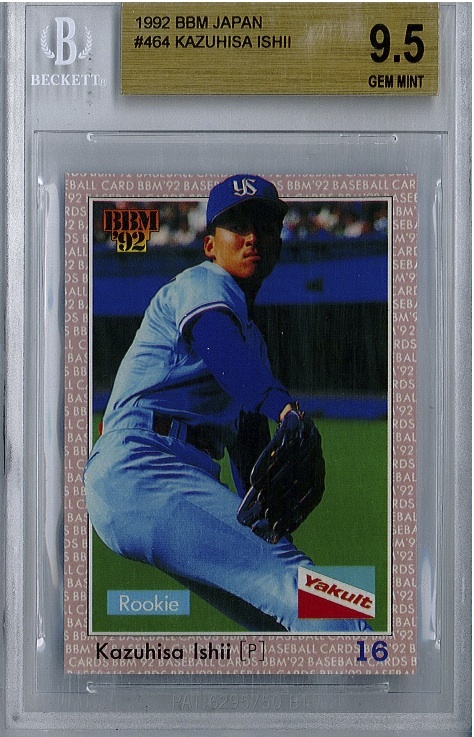 Some of the players on my list have very few examples graded BGS 9.5 or PSA 10. Kenji Johjima has just one graded Gem Mint rookie card. Others, like Akinori Otsuka, Masato Yoshii, Hisanori Takahashi and Hideki Irabu, have no Gem Mint graded copies. To compile my collection, I will have to purchase ungraded copies that I think are Gem Mint and submit them for grading myself. 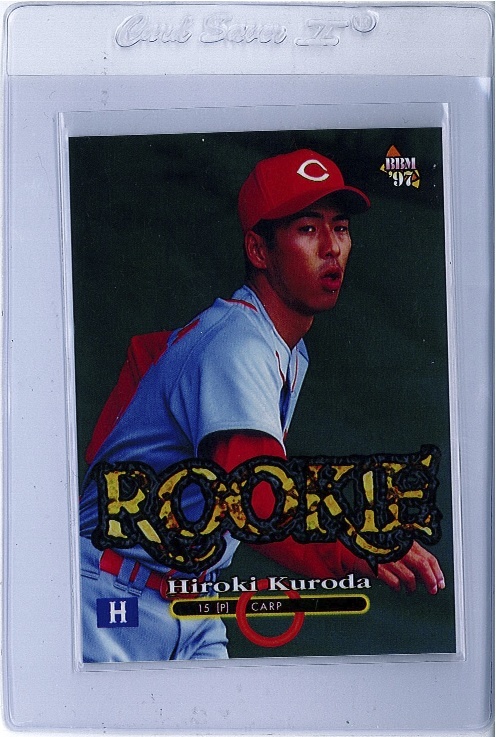 I’ve recently acquired ungraded copies of Hideo Nomo, Hiroki Kuroda and Tadahito Iguchi NPB Rookies and will be submitting them to Beckett. In my experience, all three cards should receive Gem Mint grades. Fingers crossed. In the past two years, as my collection has grown, I’ve become hooked on NPB baseball. Last March, I visited Japan for the first time and attended games at Seibu Dome, Meji Jingu Stadium and Fukuoka Dome. I had an absolute blast. Between singing (poorly) for home team players, the traditional 7th inning stretch balloon release and robots and cheerleaders on the field, NPB baseball offers an experience unlike anything we have in the states. I’m sure that as my love for NPB grows, my collection will grow with it. 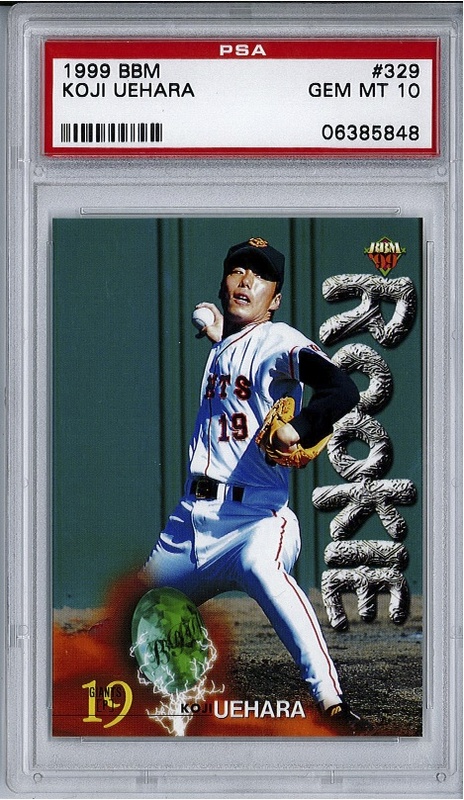 How do you collect Japanese baseball cards and why? I’d love to read about your collection in the comments section. 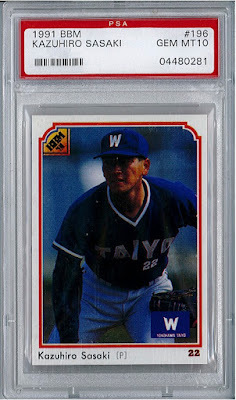 Thanks again to NPB Card guy for the platform and for providing invaluable insight on the hobby. I'll attest to the difficulties he has in finding cards that meet his standards for grading. I have a couple of the cards that he's looking for (1994 Kazuo Matsui and Tomo Ohka and the 2000 Hisashi Iwakuma) but based on the scans that I sent him, none of the cards would end up being graded "Gem Mint". I want to thank David for writing the post. It's been a while since I've had a guest post from anyone. If anyone else wants to write an essay on a relevant topic, let me know. There's a couple World Baseball Classic qualifiers going on this weekend and I was watching last Friday afternoon's game between France and Spain when I heard a familiar name announced. Former Tohoku Rakuten Golden Eagle Rhiner Cruz pitched a "perfect" inning (one out in the eighth and two outs in the ninth) for Spain. It was in a lost cause - Spain lost the game 5-3 and was eliminated. 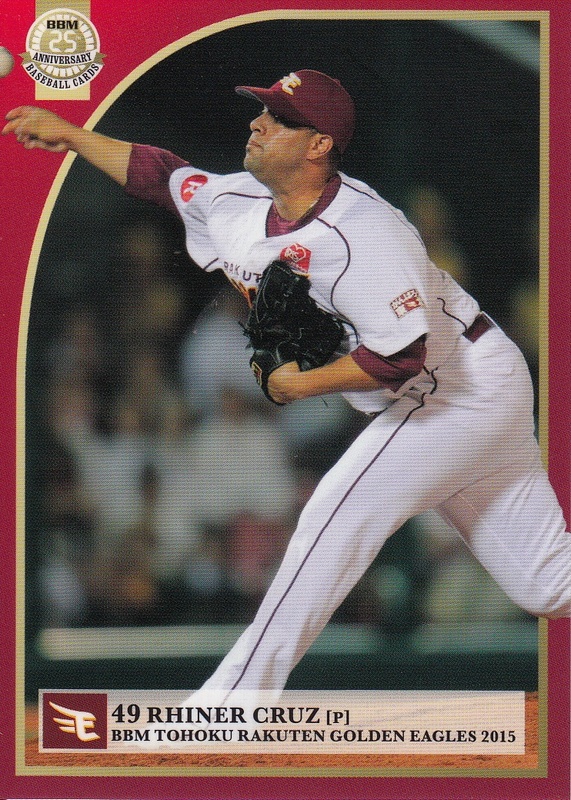 I did a little research on Cruz and discovered that this was not the first time he had pitched for Spain - he had previously appeared with them in the 2007 European Championship and Baseball World Cup, the 2008 Olympic Qualification Tournament, the 2009 Baseball World Cup and the 2013 WBC. Cruz spent around a season and a half with the Eagles, working mostly in middle relief. 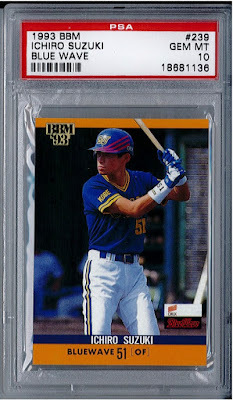 Baseball card-wise he kind of fell through the cracks - I only know of four Japanese cards of his - 2014 Owners League, 2015 Eagles team-issued set and 2015 BBM Eagles set plus a "bonus" 2014 BBM 2nd Version set included with Sports Card Magazine #106. 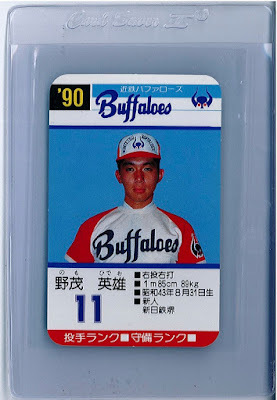 So he never appeared in a BBM "flagship" set (the SCM card really doesn't count) or Calbee set. 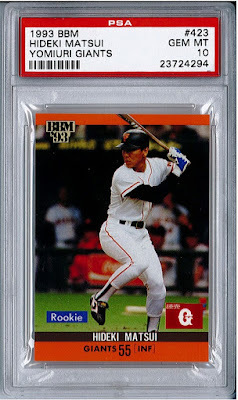 References: Jason's contributions to the Inventory Manager at SportsCardForum and the biography of Cruz at Baseball Reference's Bullpen Wiki. My copy of this year's Rookie Edition set arrived in the mail the other day and as no surprise, it looks quite a bit like the last few years versions of the set. Rookie Edition is BBM's annual draft pick set featuring the players taken in the previous fall's draft. This year's edition has 129 cards including 115 player cards for the draft picks. As far as I can tell, the only player taken in the draft not included in the set is Yusuke Matsuzawa who was taken in the third round of the ikusei portion of the draft by Yomiuri (he's not on the Giants roster so I assume he didn't sign with them). There are also two cards that sort of serve as checklist cards for the draft picks - there is a tiny head shot of each player along with his name, draft position and card number. 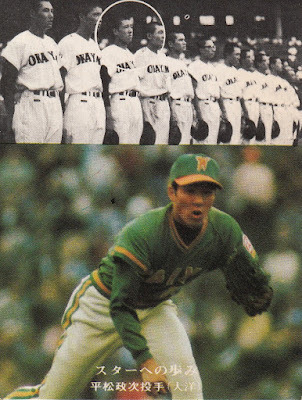 The other 12 cards in the set are the "Then & Now" subset that pair the top pick for each team with some other player from the team either past or present. 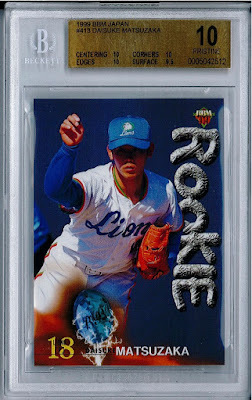 This is the eighth Rookie Edition set that I've written about and I pretty much ran out of things to say about it maybe five sets ago. As always, the pictures of the players are posed shots that were probably taken at the press conference their teams held to introduce their draft class. 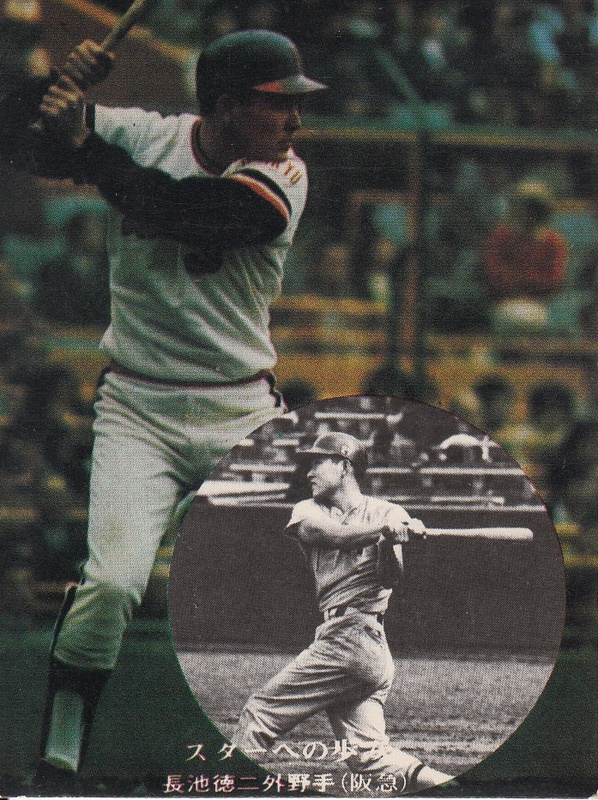 As always, I think it would be much more interesting to show photos of the players in their high school, college, industrial league or independent league uniforms although I understand how that might be a licensing nightmare. 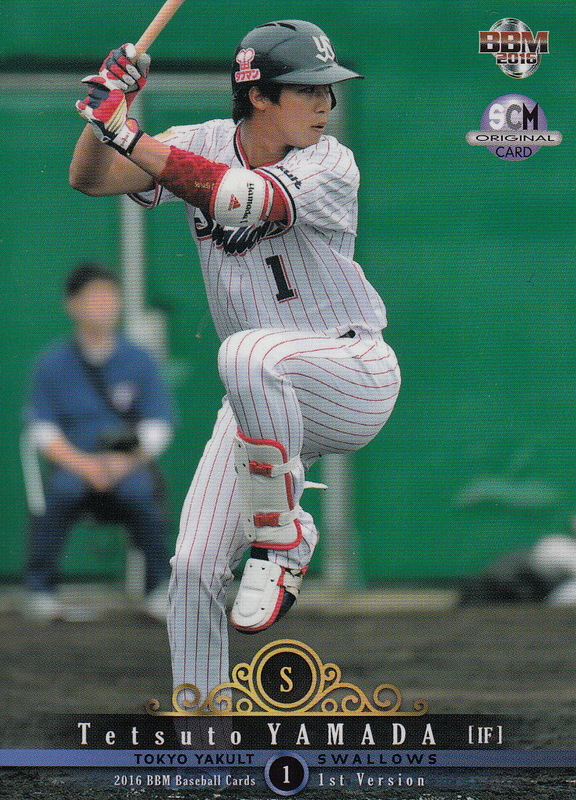 What might be the most interesting thing about the set is that with BBM lowering the number of cards in their team sets so that only players on the official 70-man roster appear in them, this might be the only set that most of the ikusei players ever appear in. I don't mean to sound like I'm down on the set - it's not a bad set. It just kind of is what it is. 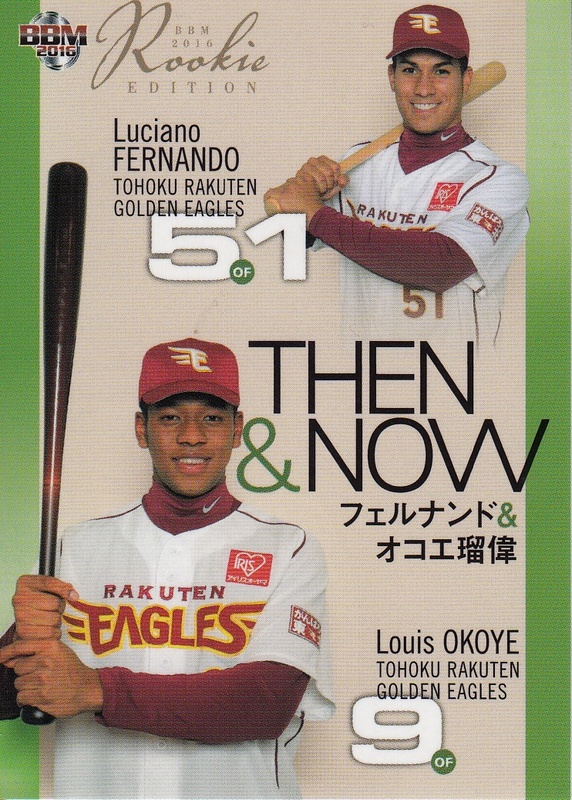 If you want a set that features the first card of every player taken in the NPB draft then you want to get this set. UPDATE - forgot to mention that you can see all the cards at Jambalaya (as usual). BBM did their monthly update of their website yesterday and announced details of eight sets that will be released over the next month or so. - The big announcement was for this year's 1st Version set which looks a lot like last year's 1st Version set. Once again there will only be 372 cards in the base set - 324 player cards (27 per team), 12 team checklist cards (don't know the theme yet but expect mascots yet again) and 36 "Cross Freeze" cards (for the fifth time in the last seven years, BBM is doing a cross set subset). There are two 12 card insert sets - "Infinite Talent" which features "young stars and note-worthy rookies" and "3D Cross" which features each team's "main star" in some sort of 3-D card. And then there's the usual cornucopia of parallels, autographed cards and memorabilia cards. The set will be released in mid-April. - The theme of this year's Icons box set is Speed, both on the bases and from the mound. Each box contains 37 cards - a 36 card base set (I think it's three players per team) plus (as usual) one special card - possibly an autographed card or a die-cut card (and maybe even an autographed die-cut card). 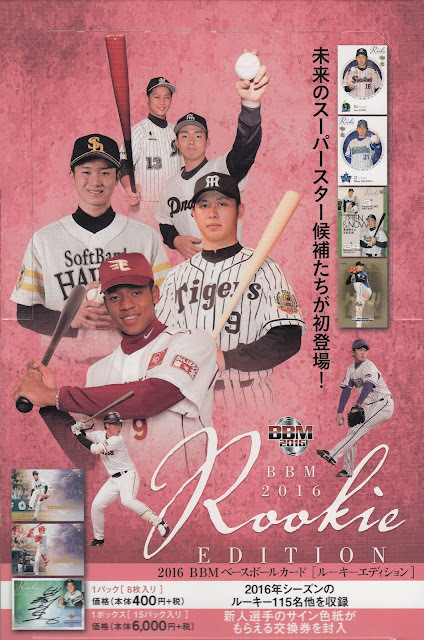 It appears that the set includes rookie players like Shinnosuke Ogasawara and Junpei Takahashi. It will be out in late March (Jambalaya says the 26th). 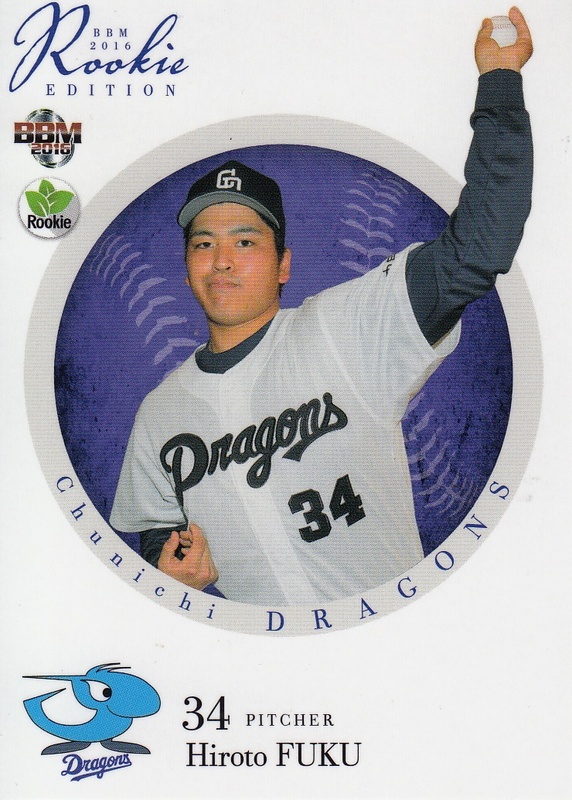 - BBM is issuing the first two of their "Autographed Edition" team box sets for the year in the next two weeks - Opening for the Fighters and Dragons Dash for Chunichi (obviously). Both boxes contain 28 cards - a 27 card base set plus one autographed card. One of the cards in the base set in each box will be a parallel card as well. The Fighters set will be out on the 24th while the Dragons set will be out a day later. - BBM has announced their first four of their pack based team sets for the year. The first two will be released in late March and are for the Eagles and the Giants (which is a bit surprising as usually the Giants set is one of the last team sets to be released each year). The sets for the Tigers and Marines will be released in mid-April. Each set will feature 81 cards in its base set - somewhere between 65 and 69 cards for the manager and players and 12-16 cards in different subsets. Each set except the Giants set has 18 insert cards spread over a couple different sets while the Giants set appears to have 21 insert cards. Each set has various parallels available both for player cards and insert cards - the Giants set appears to have the most elaborate ones. Each set also has autographed cards available but I think only the Giants set has memorabilia cards also. Last week's edition of the Japan Baseball Weekly podcast featured an interview with former Nippon Ham Fighters player (and current scout) Matt Winters. 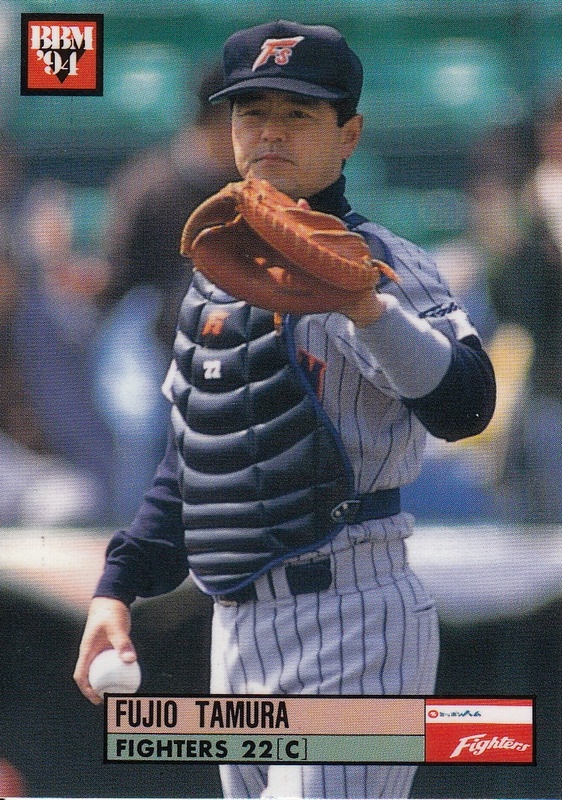 Winters spent five seasons with the Fighters from 1990 to 1994 when they still called Tokyo home. 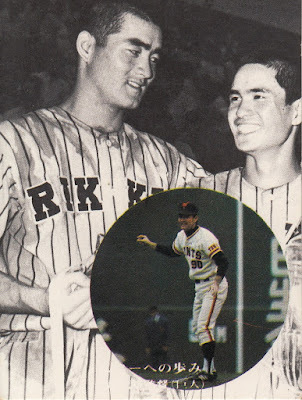 One thing that Winters mentioned that I found interesting is that when he joined the Fighters he was reunited with someone that he had played with in his first season of professional baseball - catcher Fujio Tamura. The two of them had played together on the 1978 Oneonta Yankees of the New York-Penn League. 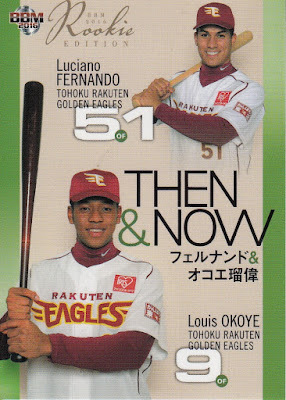 Since I'm always interested in discovering NPB players who have played in the minors in the US and I had never heard of anyone playing in the Yankees organization, I had to do a little more research. 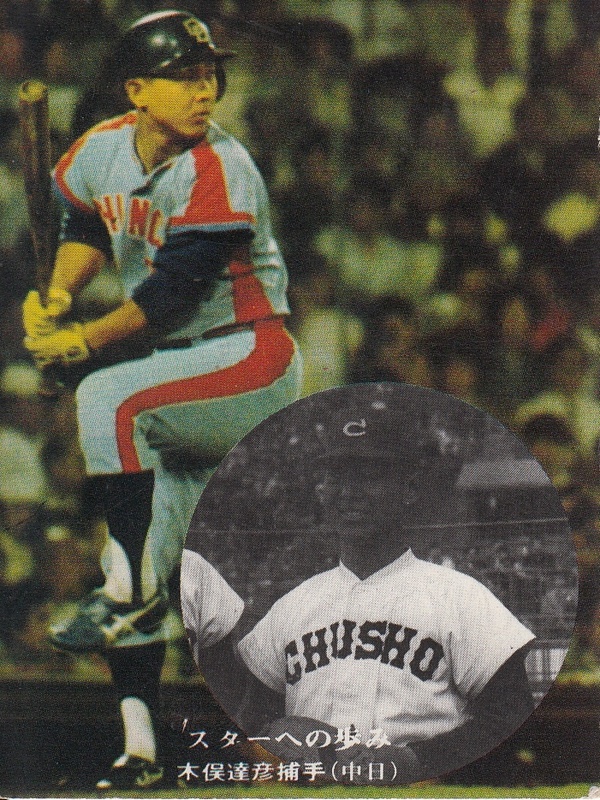 Tamura had been drafted by the Fighters in the sixth round of the fall 1977 draft out of high school (Kanto Daiichi) while Winters was drafted by the Yankees in the 1st round of the June 1978 draft (#24 overall with a compensation pick the Yankees got from the Red Sox due to Boston signing Mike Torrez as a free agent). 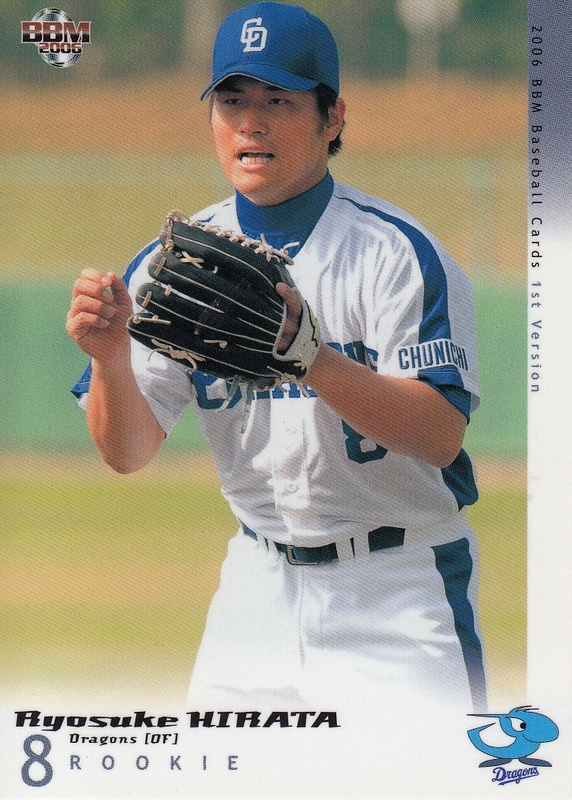 Tamura was only with Oneonta for 13 games and I suspect he was only a part time player for those games - he only had 17 plate appearances (11 at bats plus six walks) and had no hits. I'm not sure if the Yankees and Fighters had some sort of working agreement that year - the only two Japanese players on the roster that year were Tamura and infielder Haruhiko Nakano. 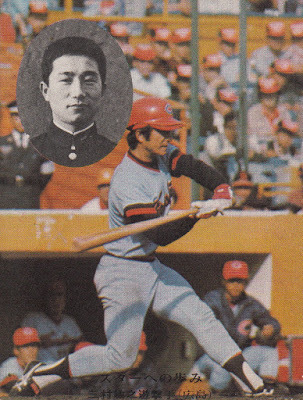 Nakano got into 20 games but also had no hits in only 14 plate appearances (9 at bats with four walks and a sacrifice). 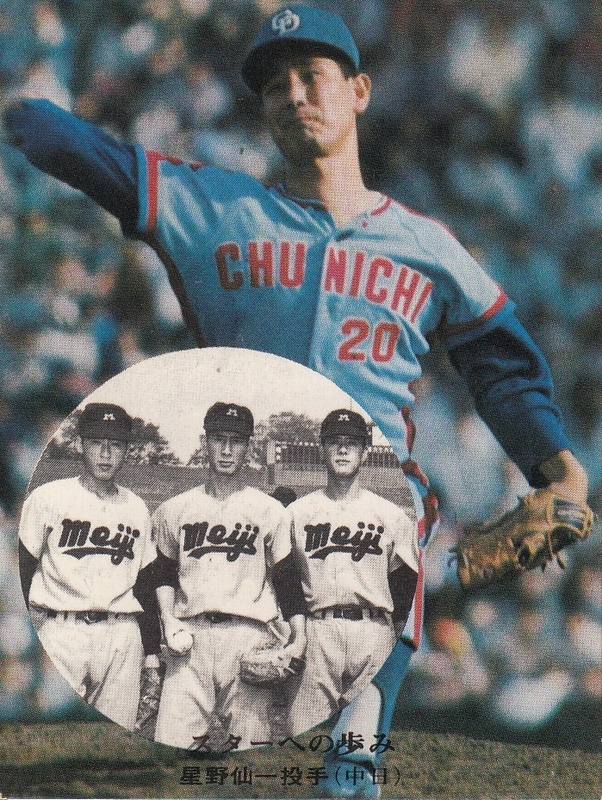 Nakano never played for the ichi-gun Fighters (or any other ichi-gun team) - about all I've been able to find out about him (other than his record in Oneonta) is that he was a sixth round draft pick of the Fighters in the fall 1974 draft out of "Shibata Agriculture" high school. 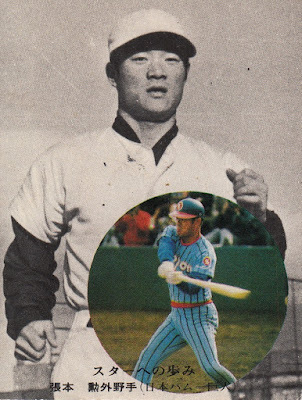 It looks like the Fighters only sent players in 1978 as there are no Japanese players on the 1977 or 1979 rosters (although future Yakult Swallow Rex Hudler was also on the 1978 team). 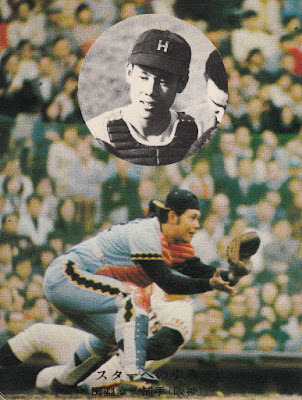 Tamura didn't debut with the ichi-gun Fighters until 1981 and he became the regular catcher for the Fighters in 1985 and pretty much remained so for the next 10 years. 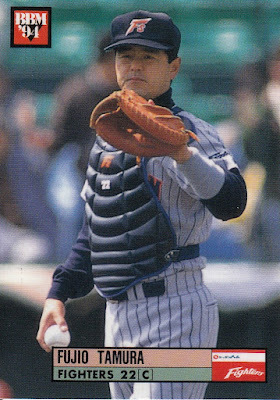 He made the All Star team nine consecutive years from 1986 to 1994 but was pretty much overshadowed for consideration for the Best 9 and Golden Glove awards by Tsutomo Itoh of the Lions - he only won the awards in 1993. He was sold to the Marines in 1996 and then signed with the Hawks as a free agent for the 1997 and 1998 seasons. He's been a coach almost every season since retiring after 1998 - first for the Hawks, then the Fighters, Dragons, Tigers and back to the Hawks where he's been since 2013. BBM has not updated their website in over a month - there's something like eight sets from them in the pipeline right now (including this year's 1st Version) but I will continue to wait to post anything about them until they put it on their website (you can see the sets for yourself over at Discount Niki and/or Hot Box). In the meantime, there's a couple other releases to talk about. - Series One from Calbee hits the stores on or around March 21 (that's the official release date but don't be surprised to see them showing up online a few days before that). The base set has 72 player cards (six per team but you already had guessed that) along with 18 "Title Holder" cards, 10 "Legend" cards (for retired players) and four checklist cards (looks like the theme for them is the 2015 post-season). As usual there's a 24 card "Star" insert set (and I'm assuming that it has the gold facsimile parallels but there's nothing on the web page about them). There do not appear to be any "lucky" cards or premium box set available with the set. 3/19 UPDATE - as I speculated, the cards are already available. The 10 card "Legend" subset is actually a premium subset/insert set so the base set is 94 cards (72 player cards + 18 "Title Holder" cards + 4 checklist cards). - I've been wondering for a while if Epoch somehow acquired Front Runner as the Dragons X Mizuno set that Epoch put out last fall strongly resembled some Front Runner sets from 2014 (and Front Runner hadn't issued any sets since spring last year). Epoch has announced a Lions "Stars & Rookies" set that will be released in April which looks kind of similar to the "Heroes & Rookies" box sets that Front Runner did last spring. The big difference is that the new set is not a box set - it looks kind of like a high end set. Each box (which has an MSRP of 10,800 yen or around $95) contains two mini-boxes. Each mini-box contains five "regular" cards and one autograph card. The base set has 29 cards and there's a myriad of possible autograph cards. It will be interesting to see if Epoch releases similar sets for other teams the way that Front Runner did the last couple years. Samurai Japan completed their two game sweep over the Taiwanese national team this weekend by beating them 9-3 today in Osaka. The game was fairly close entering the top of the ninth inning with Japan up 3-1 but they then rallied for six runs to blow the game open. The big blow in the inning was a bases loaded triple from Dragons outfielder Ryosuke Hirata which put Japan up comfortably 7-1. 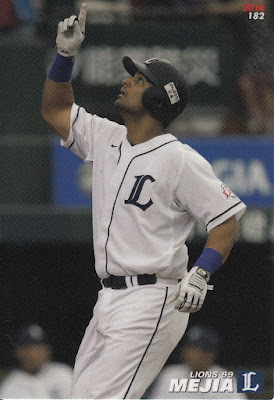 This was followed moments later by a two run home run by Yoshitomo Tsutsugo of the Baystars to really seal the deal. Calbee released their largest set ever (1472 cards) between late 1975 and late 1976. Ryan has done an excellent job of identifying some 26 separate series that the cards were released in although it is believed that the actual number is more like 40. I wanted to highlight one series that he mentioned - the "Star History" cards - that appears to have been issued in late 1975. The series contained 36 cards numbered 289 to 324. 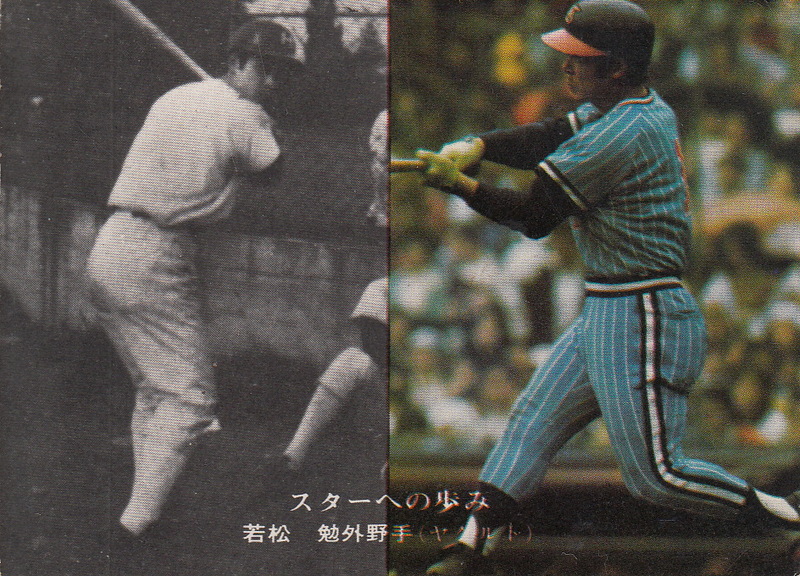 Each card featured a color photo of the player along with an older black and white photo. In some ways these cards resembled the "Boyhood Photos Of The Stars" cards from the 1972 and 1973 Topps sets except that most of these photos showed the player with his high school or college baseball team. There are a couple that show a photo of the player earlier in his NPB career, possibly with a different team than he was on when the card was produced. Most of the high school names I've listed here are from Google translations of Japanese wiki pages so they may not be correct. There's a couple interesting things about this sheet. 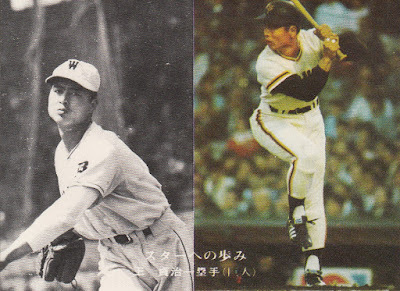 The first thing is the inclusion of two NPB players - Yoshinobu Takahashi of the Giants and Kei Igawa of the Tigers. I know the Yankees played each of these teams in exhibition games before the regular season games so I assume that the sheets were given away at these games as well (not sure if Tampa played any exhibition games). The second thing is that while ostensibly all these cards supposedly are from an Upper Deck set called "First Pitch" (which appears to have been their version of Topps Opening Day and BBM Preview - a smaller set using a similar design to the company's "flagship" set), none of these eight cards actually appear in the set. Obviously you wouldn't expect the Takahashi and Igawa cards in the set but the actual cards of Matsui, Jeter, Huff and Baldelli cards use different photos and Crawford does not actually have a card in the set. Alex Rodriguez's card in the First Pitch set depicts him still playing for the Rangers - he had just been traded to the Yankees on February 16th, barely a month and a half before the Opening Series. I suspect that this is the first baseball card to depict Rodriguez as a member of the Yankees. 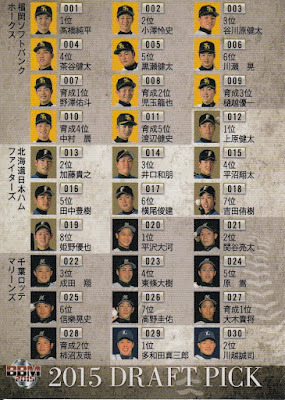 The back side of the sheet is taken up by a large shot of Matsui with what looks like a directory of stores in Japan that stocked Upper Deck baseball cards in 2004. 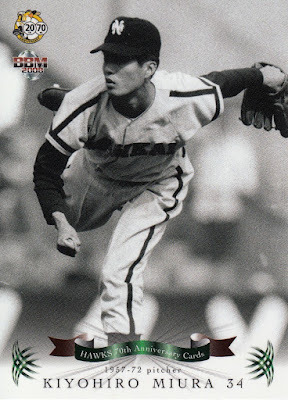 There have been commemorative sheets produced for other MLB Opening Series in Japan but I don't think any of the others are as interesting as this one. In 2000, Fleer produced a sheet for the Mets-Cubs series but it was a simple promotion sheet for their Tradition set - only two of the eight players included were actually on the Cubs (Sammy Sosa) or the Mets (Mike Piazza). The other six players were MLB stars from other teams - Ivan Rodriguez, Mo Vaughn, Derek Jeter, Chipper Jones, Pedro Martinez and Cal Ripken. In 2003 MLB had planned to have the Mariners and Athletics open the season in Japan but called it off due to security concerns with the start of the Second Gulf War. A commemorative sheet was created by Upper Deck and has somehow found its way to the collectors market. 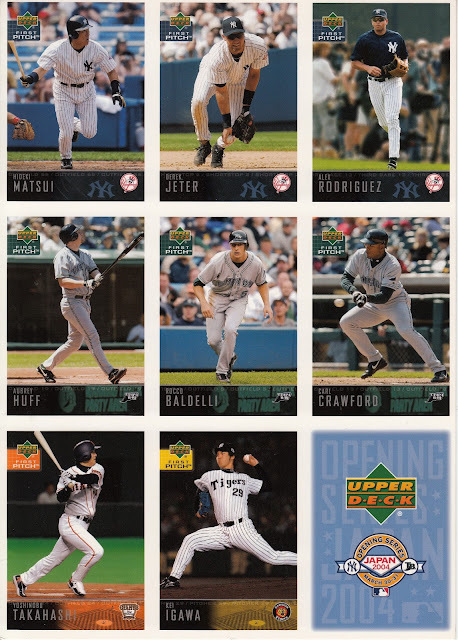 The sheet shows eight players - four from the Mariners (Ichiro, Edgar Martinez, Bret Boone and Freddy Garcia) and four from the Athletics (Tim Hudson, Eric Chavez, Barry Zito and Miguel Tejada). 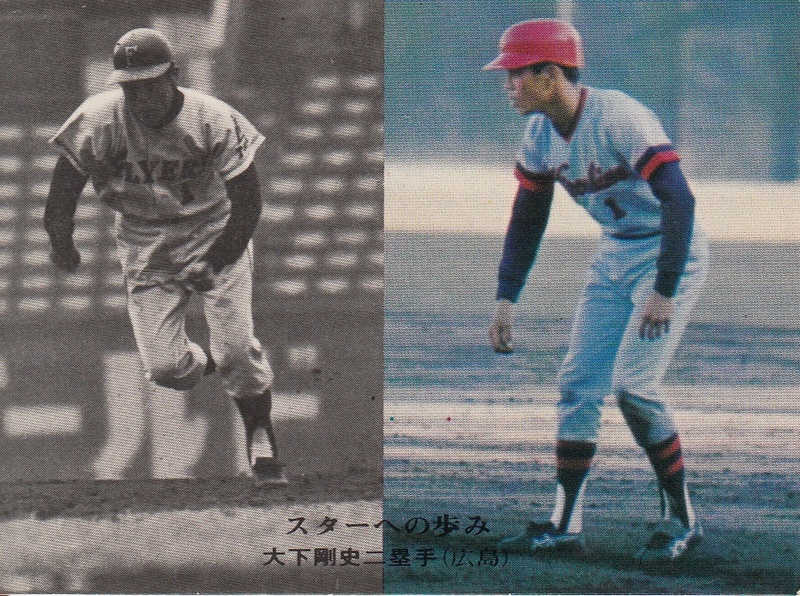 All the cards are identical to the corresponding cards in the Upper Deck "MVP" set. 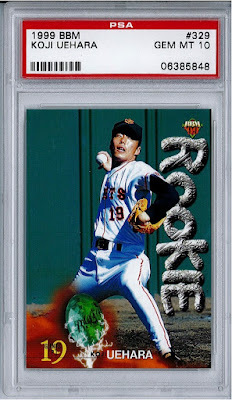 The back of the sheet is similar to the 2004 sheet - a directory of Japanese Upper Deck dealers superimposed over a picture of Ichiro. 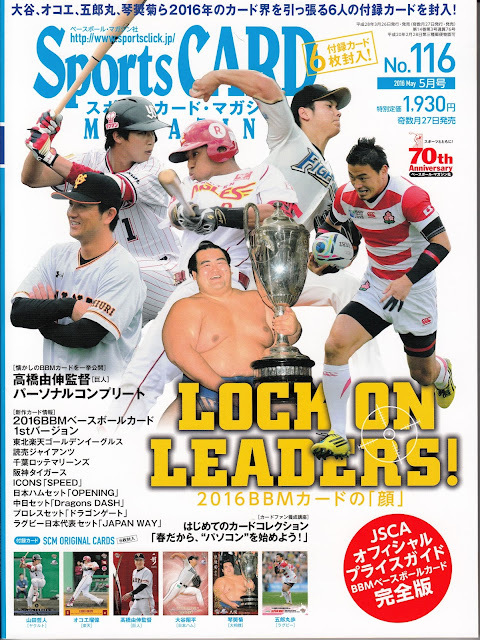 MLB has opened the season in Japan on two other occasions - 2008 (Red Sox and Athletics) and 2012 (Mariners and Athletics). I have not seen any commemorative sheets for those series but I don't know that there aren't any.